Full frame eastern white pine. 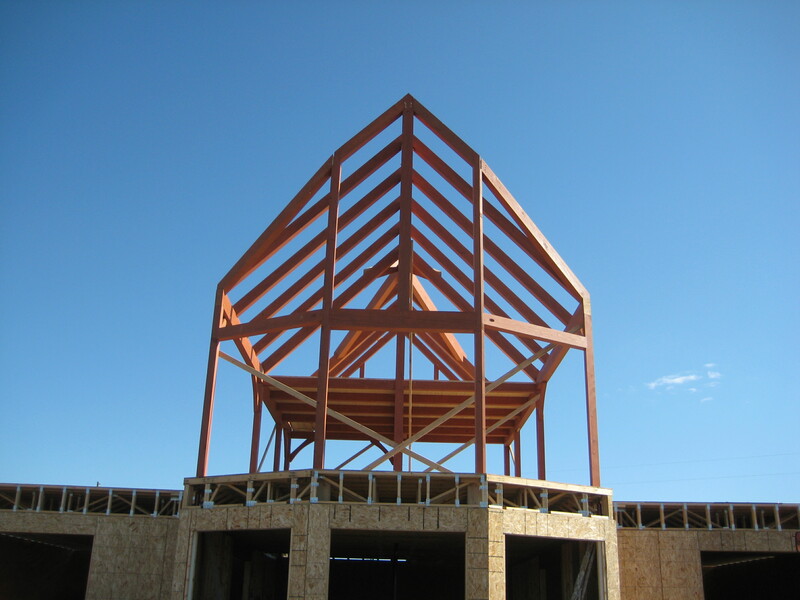 Timber framing structure is an ancient method of building construction and dates back to the earliest recorded in history. The first settlers brought this tradition to the United States. 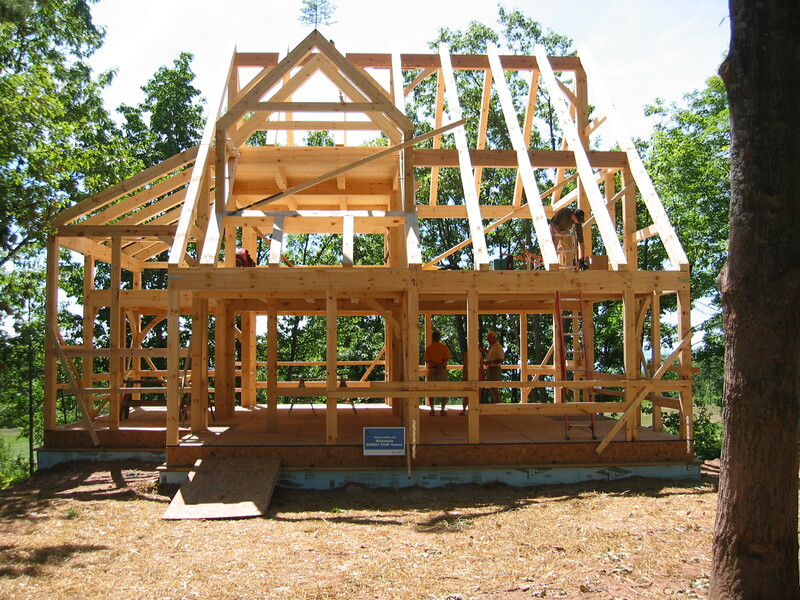 Timber framing was the dominant form of construction in the States until the early 19th Century. This style of building went to the wayside for two reasons. First, there was a lack of large trees, particularly in the West. Second, the development of the circular saw and round nail brought on a revolution. Pre-sawn nominal timbers were easier to ship via railroad and could be constructed by a smaller crew. Timberpeg®takes its design from traditional mortise and tenon joinery. This centuries-old technique of securing timbers with oak pegs is the primary fastening system used with Timberpeg® timber frames. This is a Douglas Fir frame that was stained by the homeowner prior to erection. This project would be considered a timber frame hybrid, which means only this part of the home was built using timber frame. 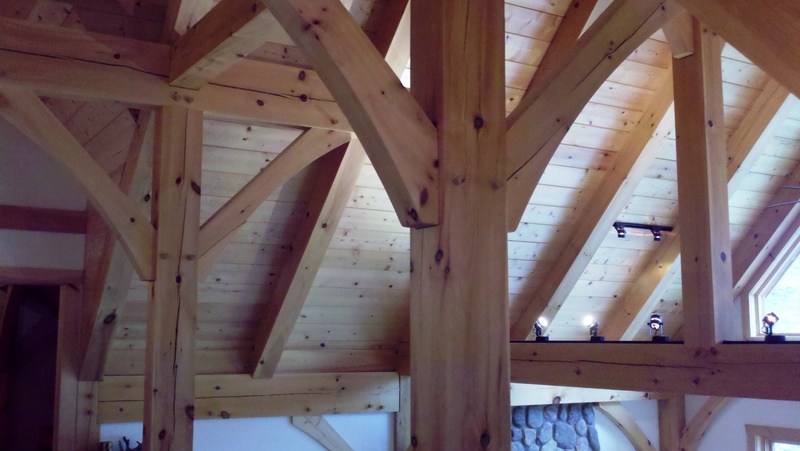 This is a full timber frame home using eastern white pine. Here you can see the curved knee braces which add character to the home. 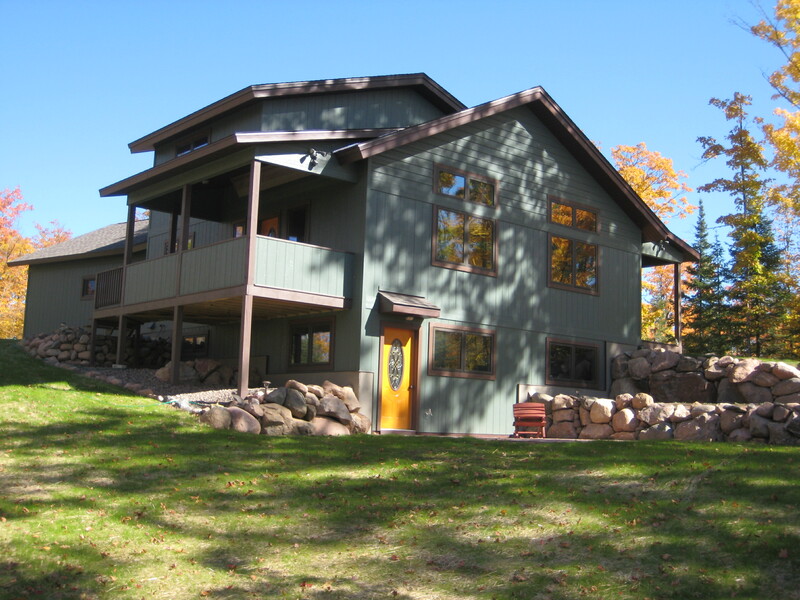 A Timberpeg® home is not only gorgeous but the company keeps the environment in mind throughout the whole manufacturing and building process. Cutoffs from their manufacturing process are recycled locally and made available at no cost to people who use them for fuel, crafts and other projects. The sawdust is also donated to local farmers. Timberpeg® uses citrus-based cleaners to clean their tools, which wont harm the environment and most of the tractors and trucks are powered with biodiesel fuel. Not only are their factories environmentally conscious, but they are dedicated on helping you preserve the environment as well. 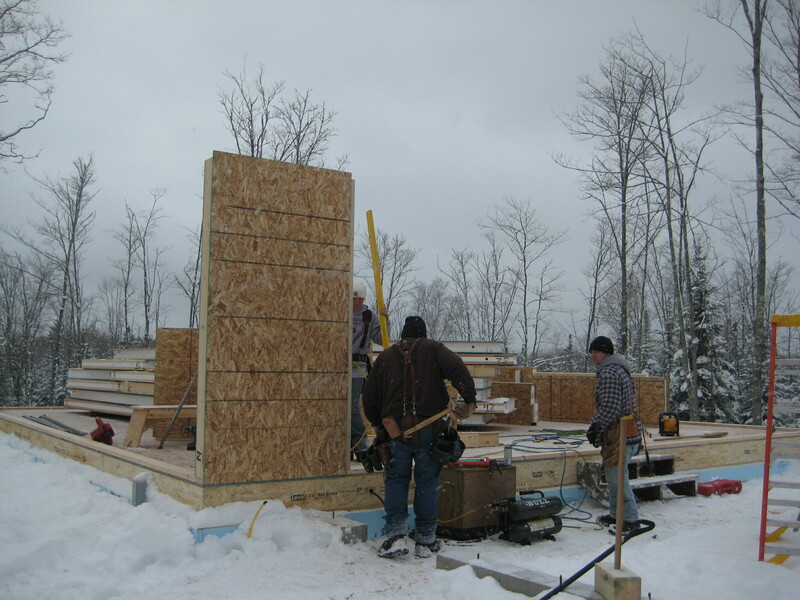 A Timberpeg® home can be equipped with structural insulated panels (SIP) which will save money on energy costs and reduce energy consumption. 1. Agree on a realistic budget: Be upfront with your Timberpeg® representative about a budget. There are three variables of construction: size, complexity, and level of finish. All of these can be adjusted to build the home you want an within the budget you specified. 2. Plan Based on the Framing: You want to make sure your framing and the floor plan work well together in order to avoid going over budget due to having to customize the frame design. 3. Don’t overbuild: It can be easy to get caught up in the beauty and want to add more luxuries such as stonework, professional appliances, and custom interior and exterior trim. However, these features will drive up the building costs. 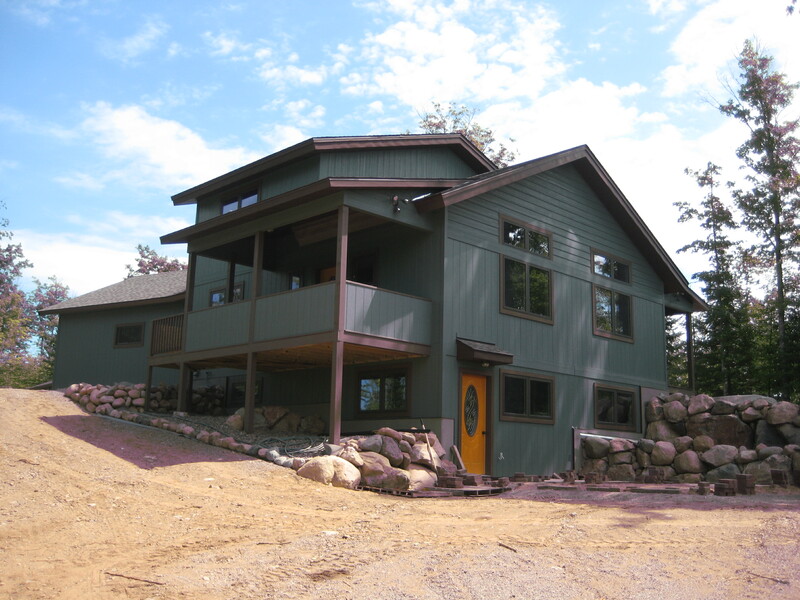 Great Lakes Carpentry is an independent representative of Timberpeg® and can’t wait to help you get started on your new Timberpeg® home! Think about that last scalding hot cup of coffee you bought and how that 1/8 inch foam cup kept your coffee hot and your hand cool. That is exactly how an Enercept SIP (Structural Insulated Panels) home operates. 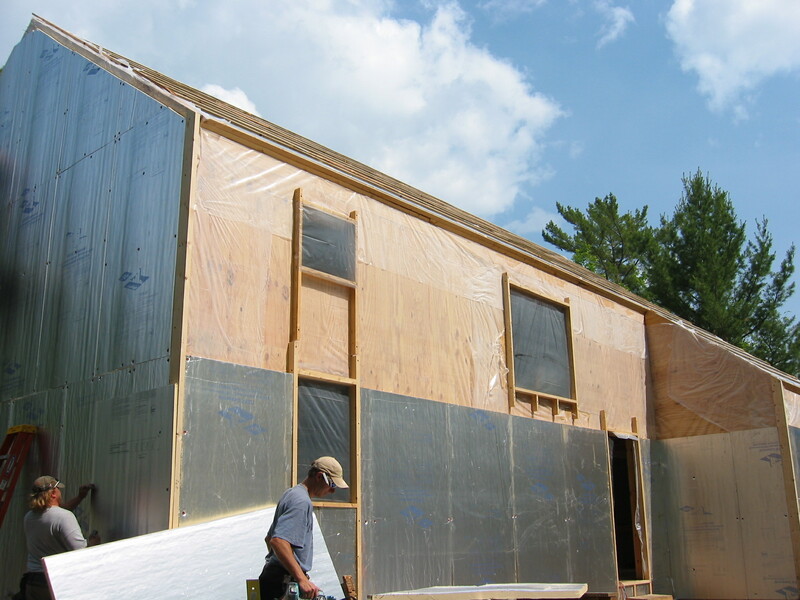 We refer to this project as the “Energy SIPPER” which was built in Mercer Wis.
We like to call our SIP Homes “Energy Sippers” because that is exactly what they do. They use as little energy as possible to heat and cool your home. This feature will save you 40% to 60% on your energy bills. 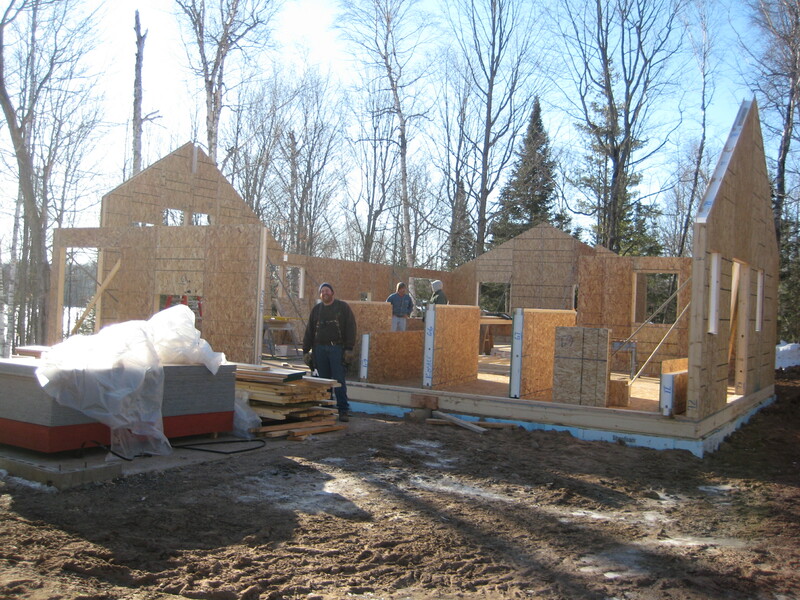 SIP homes are very air tight keeping the heat in and the cold out. These are the actual panels before they get dressed up with siding. If you look closely you can see the insulation between the wood panels. Heat Recovery Ventilator (HRV) or an Energy Recovery Ventilator (ERV). These systems will allow you to manage the humidity in the home and will provide a complete change of air on average every four hours during the winter months. A SIP home doesn’t have any thermal bridging which will keep all the heat in your house during the winter months and keep it nice and cool during the summer. Another benefit of a SIP home is how quiet the home is. The insulation will keep all the noise outside where it should be. 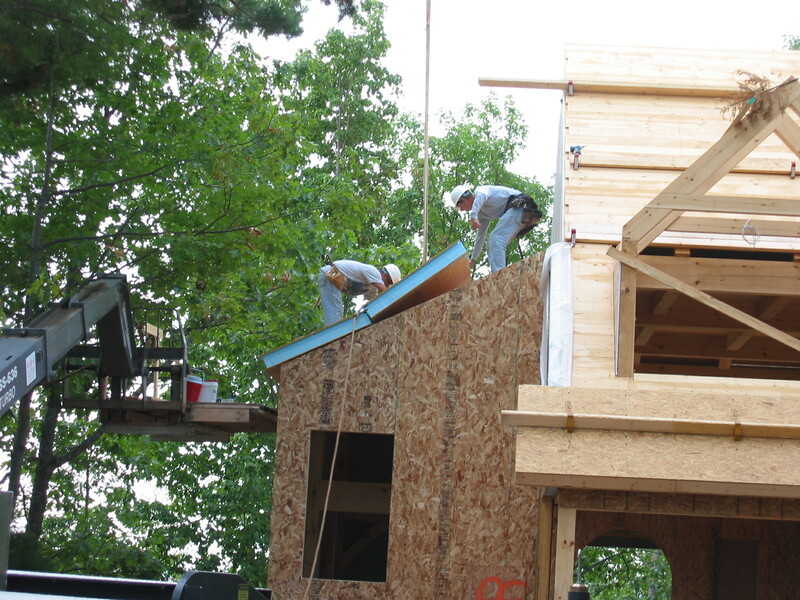 A SIP home comes together very quickly due to the fact that the panels are already assembled when they get to the job site. 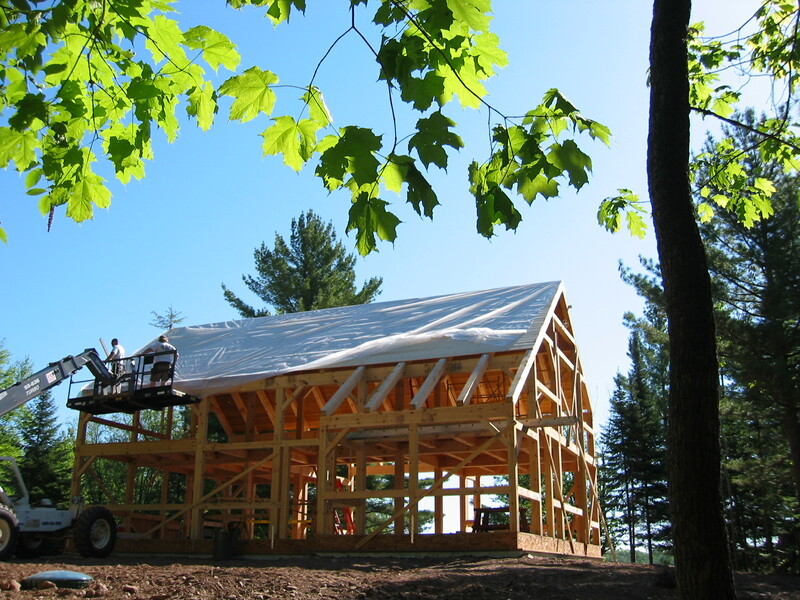 For example, an 1,800 square foot structure can be assembled in less than a week. This also equates to less job site waste making this method of building a better for the environment. Enercept panels are the most customizable panels on the market. Meaning you can build the home exactly the way you want it. For example instead of having your outlets at the typical 16 inch height above the floor, you might prefer to have them up 24 inches. This will make plugging in your electronics easier. Enercept panels will allow you to do that easily. 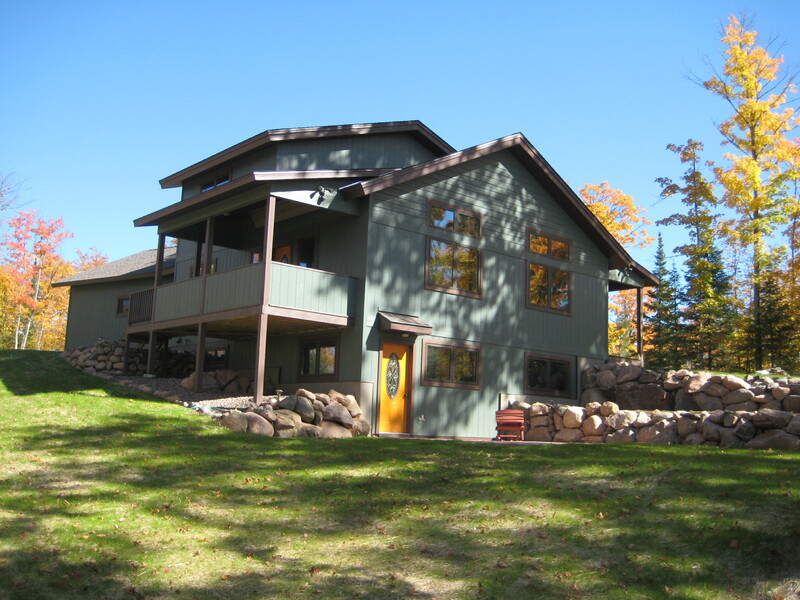 Great Lakes Carpentry is an independent dealer and factory trained installation specialists. Enercept offers fee panel quotes. Stop by next week where we discuss Super Insulated Windows: Serious Windows.